Hello, Sploder! This is Autumnwinter with my smash hit- Soda Jerk! Sell soda to the hungry customers, watch out for the food critics, and be on the look out for obstacles! Travel through eight levels- Snack Shack, McAutumn's, Space Station, Winter Kitchen, Sweet Spring, the Garden, Entoxia (check that game out, too! ), and good ol' Rainbow Road. I hope you like these little animes! The five soda jerks are Larry the Lemon Jerk, Gabi the Grape Jerk, Ollie the Orange Jerk, Chessie the Cherry Jerk, and Rover the Root Beer Jerk. 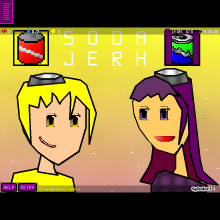 I will be making a Soda Jerk 2, but it will be sometime in 2015. So for now, enjoy Soda Jerk and watch for new games, like NSMBU World 4, SweetRoller World 11, PixelPalace World 14, Sploder Auto Part 8, and When Burgers Attack Warp Key 3. Byeeeeee!